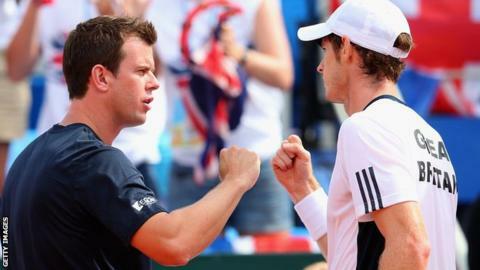 Great Britain Davis Cup captain Leon Smith thinks Scotland "deserves" more high-profile tennis tournaments. Glasgow's Emirates Arena will host the first-round tie with the United States in March. "South of the border gets a lot of tennis, there are lots of grass-court events and the Tour Finals that are on next week," Smith told BBC Scotland. "With Andy Murray coming through and becoming a Wimbledon champion, Scotland deserves the opportunity for access." "This is a chance for people to get right behind the team; really make some noise, create a football-style atmosphere." With world number six Murray expected to lead the side in Glasgow and his brother Jamie in contention for a doubles spot along with fellow Scot Colin Fleming, there could be a strong local flavour in the GB team. "With it being Andy's first time playing in Scotland since winning Wimbledon, it's a sort of homecoming," added Smith, another Scotsman. "I think this is the start of something; whether it's Davis Cup or more events, exhibitions or maybe in the future looking at a Tour event as a possibility. "We've had a few experiences of playing Davis Cup at Braehead and every time the crowd has been fantastic. "This is an important match for us and that's why we need the fans behind us. "And this is a chance for people to get right behind the team; really make some noise, create a football-style atmosphere. "It's different and the players need it. People who went along to the Commonwealth Games and Ryder Cup in Scotland this year will come along. "It won't just be the tennis purists."